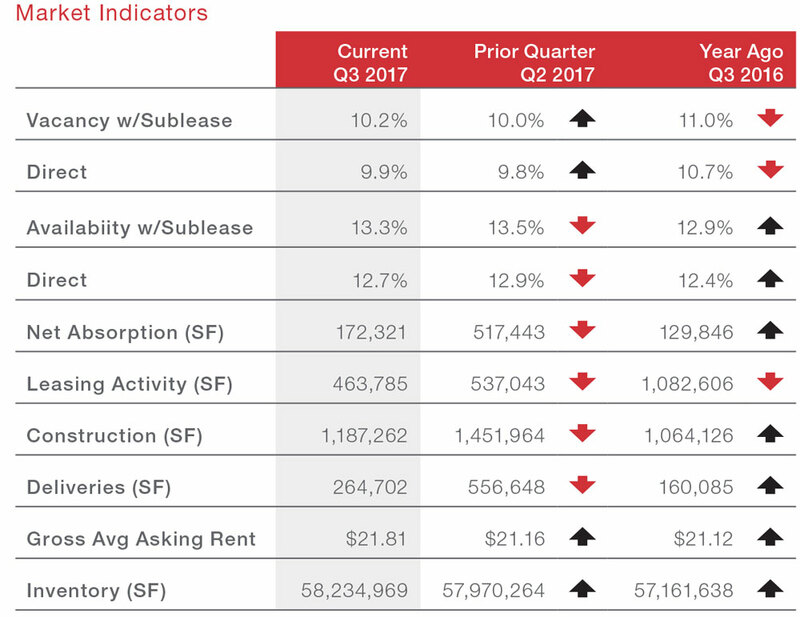 San Antonio’s overall vacancy rate rose to 10.2% in Q3 2017, an increase of 20 basis points quarter-over-quarter and 80 basis points year-over-year. Net absorption remained positive at 172,321 sq. ft. as of the quarter’s end, down from 517,443 sq. ft. as of Q2 2017, although up from 129,846 sq. ft. this time last year. Year-to-date deliveries total 1.1 million sq. ft. with an occupancy rate around 60%. 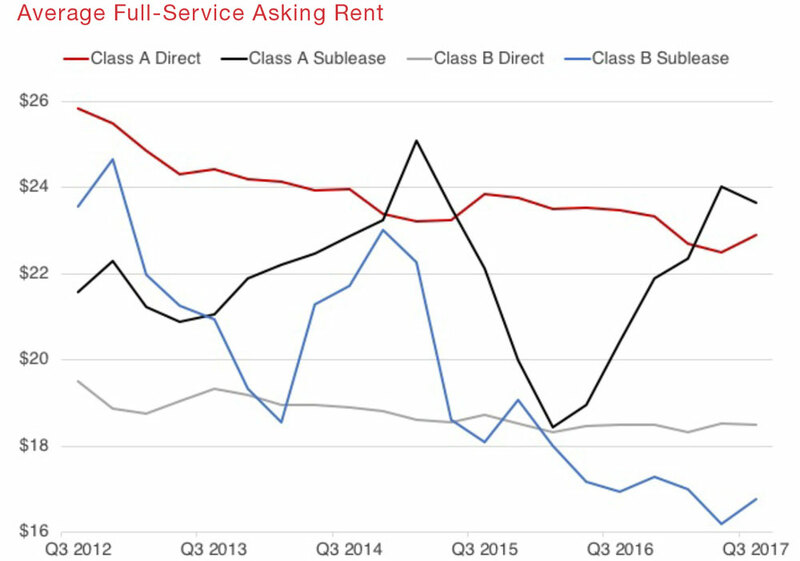 Full-service asking rents jumped up by $0.65 per sq. ft. quarter-over-quarter to close Q3 at $21.81; with an even larger gain of $0.69 per sq. ft. year-over-year. San Antonio’s leasing activity dipped slightly to 265,000 sq. ft., down from the previous quarter’s 557,000 sq. ft., although up 160,000 sq. ft. a year ago. The amount of space under construction ended the third quarter at 1.18 million sq. ft. with 435,000 sq. ft. scheduled to deliver this year, including buildings that are primarily owner-occupied. The economy fast-tracked in August, as the San Antonio Business-Cycle Index increased at its fastest pace since 2016, while the area unemployment rate remained the same and job growth surged. Jobs increased at a strong 3.6% annualized rate over the three months through August. Mining and financial services employment led overall growth among the major industries, followed closely by construction. 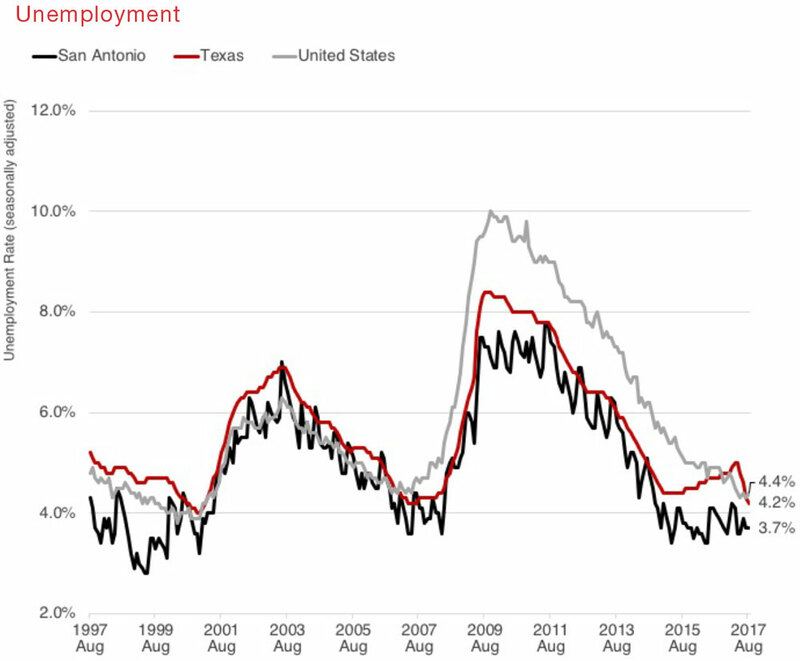 As for unemployment, the non-seasonally adjusted rate for the San Antonio metro remained at a low 3.7%, well below the seasonally adjusted national rate of 4.4% and state rate of 4.2%. Of the 264,702 sq. ft. of new supply delivered in the San Antonio office market during Q3 2017, much of that space is available for lease. 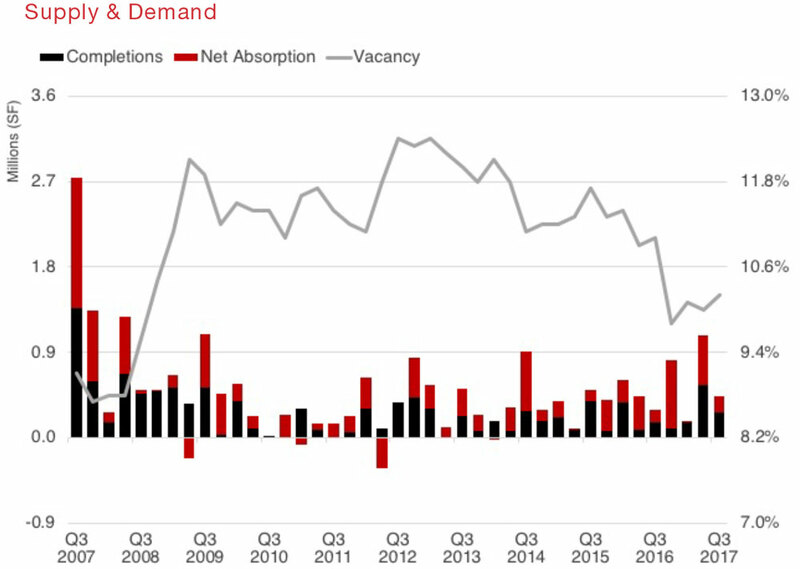 Net demand has slowed from the pace it was at in 2016, causing a slight uptick in vacancy. All told, the San Antonio office market remains resilient. Local experts recently gathered in San Antonio to discuss what types of companies are moving to San Antonio. The consensus was medical device manufacturers, financial call centers and even Whataburger’s headquarters. It is easy to do business in San Antonio with a ready workforce, low-cost energy and affordable infrastructure. The cities increased momentum has been attributed to companies such as SeaWorld, Hyatt Resorts, Nationwide Insurance, and Chase Credit Card Center, repositioning San Antonio away from primarily the tourism industry. Leading the way into the future are UTSA and the UT Health Science Center, Southwest Research and the Texas Biomedical Institute, in addition to boasting the largest military healthcare installation in the country. In mid-October, build-out began on the 230 acres in the San Antonio Medical Center, including a $40 million primate research center on aging, as part of the ongoing advancement of medical, education and research commitments in the Alamo City. San Antonio ended the third quarter of 2017 with positive 172,321 sq. ft. of net absorption. Class A space represented 20,118 sq. ft. of that total, and Class B space was responsible for 132,333 sq. ft. This marks the fourteenth consecutive quarter of positive absorption, beginning with Q2 2014. 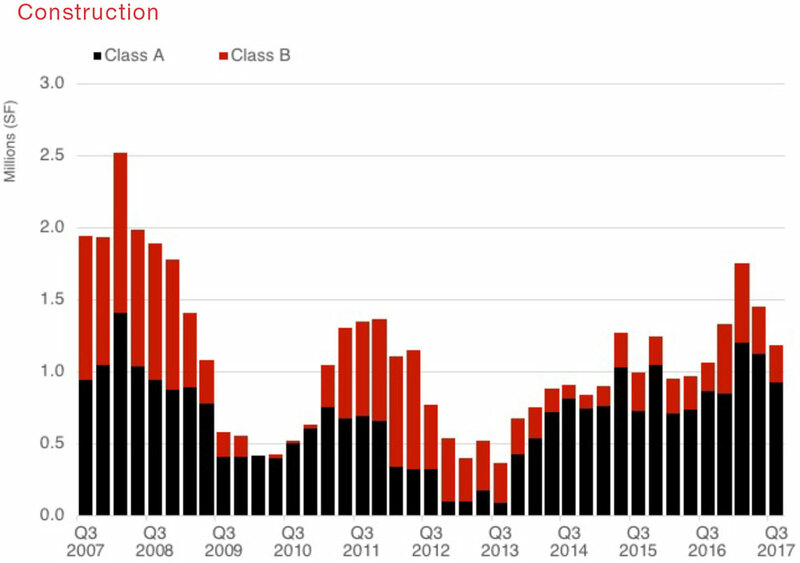 The major move-ins contributing to net absorption in 2017 include 100,000 sq. ft. of space occupied by GM Financial, at 3302 N. Ellison Dr. in the Far West submarket; and 40,000 sq. ft. taken by Well-Med in The Oaks at University Business Park at 12461 Network Blvd. in the Northwest submarket. 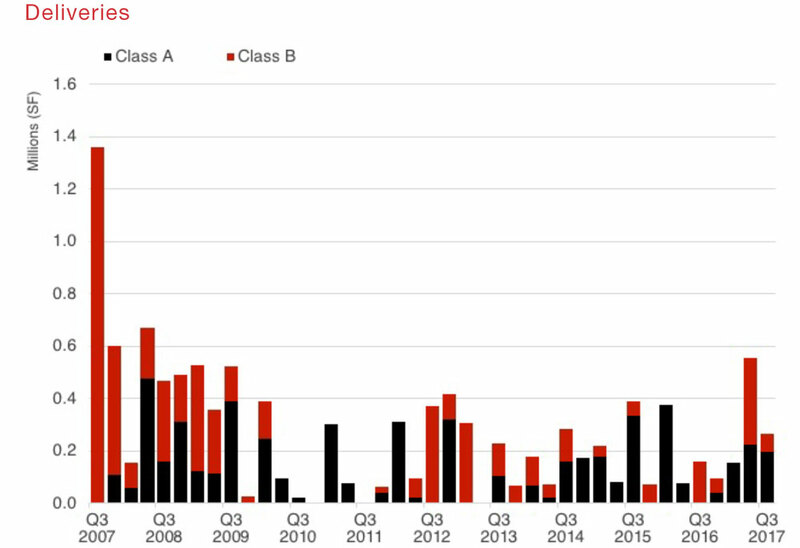 Although a slight slowdown in activity took place during the third quarter, much of the cause can be recognized in the delivery of vacant new product. There is currently 1.18 million sq. ft. of space under construction in the San Antonio office market, with about 530,000 sq. ft., or 45% available for lease. Ongoing activity includes Frost Tower at 111 W. Houston, set to deliver in early 2019; and Security Service Federal Credit Union planning to move into its 270,000-sq.-ft. campus, at 14880 I-10 W. in the fall of 2017. Some of the notable 2017 deliveries include Stream Private Data Center – Building III, a 184,000-sq.-ft. facility that delivered in Q2 of 2017 at 100% occupancy, and Landmark One, a 167,618-sq.-ft. building that delivered in Q3 of 2017 currently 32% occupied. As for future construction, Kallison Square in San Antonio is scheduled to begin during the spring of 2018. The $83 million mixed-use project will be located at the southwest corner of Flores and Dolorosa streets in San Antonio. The project will include 45,000 sq. ft. of office and retail space, as well as 305 multifamily units. The project’s completion date is mid-2020. 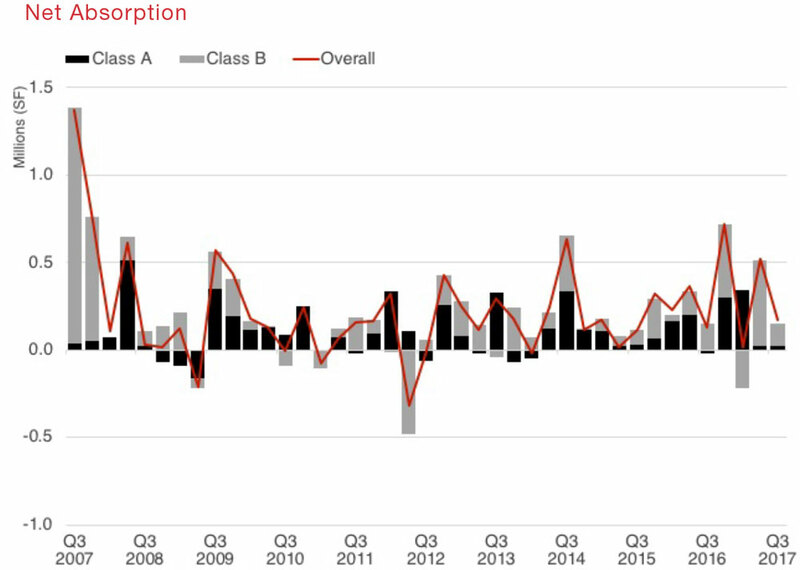 Real Capital Analytics data reports year-to-date office sales volume in the San Antonio area at $541.6 million, resulting in a year-over-year change of 128%. The buyer composition is primarily private at 62%, 27% institutional, 6% public listed/REITs, and 5% user/other. A positive sign for the San Antonio office market during the summer was the acquisition by USAA Real Estate, of the Bank of America Plaza at 300 Convent St.; a 28-story 533,171-sq.-ft. office building, from Clarion Partners JV Griffin Partners. The property was built in 1983 in the Downtown CBD submarket. 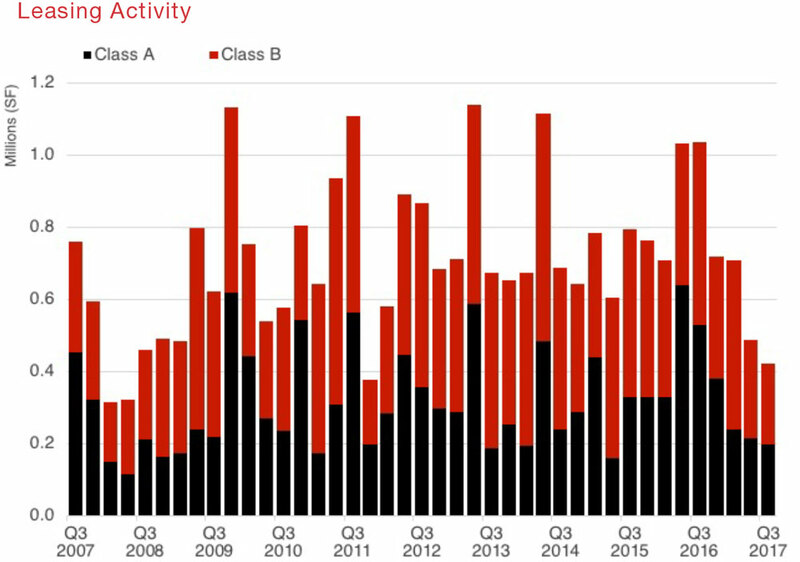 Leasing activity decreased slightly during the third quarter with a total of 463,785 sq. ft. leased in the overall San Antonio market, a drop of about 73,000 sq. ft. from last quarter. This is in comparison to 1.1 million sq. ft. leased this time last year. Class A space led the way at about 200,000 sq. ft., followed by Class B fulfilling 225,000 sq. ft. The largest lease signings occurring in 2017 included the 45,935-sq. ft. deal inked by Wells Fargo at 151 Technology Center; and the 30,511-sq.-ft. lease signed by Methodist Health Care at Landmark One, both located in the Northwest market. Touching on expansions, San Antonio-based CaptureRx will be expanding into the San Antonio Light building at 420 Broadway, with pending plans to move in between July and September 2018. The market saw overall full-service average rates continue to rise at $0.65 per sq. ft. quarter-over-quarter to close at $21.81 per sq. ft. at the end of Q3 2017. Class A rates saw an increase of $0.32 at $25.70 per sq. ft. quarter-over-quarter, compared to Q2 2017 at $25.38 per sq. ft. A larger rise took place from a year ago when Class A average rates were at $24.35, an increase of $1.35. Class B rates rose to $19.59 per sq. ft. quarter-over-quarter, compared to Q2 2017 at $18.89 per sq. ft., a $0.70 increase. With the addition of the new Class A buildings being constructed, tenants seem to be ready to pay the higher rental rates.